New Fabric for your Door Awnings – Update the look and colors on your home with new canvas covers for your awnings. For just a fraction of the cost of a complete new awning, you can order new fabric and create a whole new look for your home. With our low price’s for replacement canvas for your door awnings and over 100 Sunbrella Fabric Colors to choose from, its a fun way to freshen up your home’s exterior. We guarantee our replacement canvas for door awnings to fit our PYC Door Awning frames.We do not guarantee that PYC Awning recovers will fit other manufacturer’s frames. However, we can custom make any canvas door awning cover. Price’s for custom covers are typically 25% – 50% over the low cost of our standard covers for Door Awnings depending on the style of your awning. 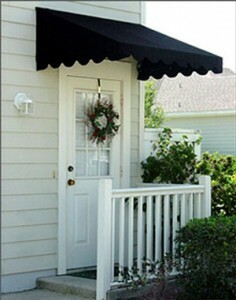 For a price quote on custom covers, please email us with rough measurements and a description or photo to PYC Awnings. For the perfect fit before we make your awnings, we recommend you send your old canvas to us for sizing. If you have ordered an awning from us and would like it recovered, but are unsure of the size, please contact us, and we can find the size you need. If you do purchase a PYC awning recover to fit another manufacturer’s frame and it does not fit you can purchase the frames and mounting hardware from PYC Awnings separately.